When I look back at the summer before I left for my first year of college, I remember how excited I was to begin a new chapter in my life. One experience that I looked forward to was having a roommate or multiple roommates, and I hoped that I would live with people that I could relate to and would enjoy spending time with. I eagerly filled out a room draw form that asked me for my favorite music, movies, etc. As I spelled out my love for Rush, 2Pac, Anchorman, and Good Will Hunting I never even contemplated the rooming situation that I would end up with. A couple months after I filled out my room draw, I received an e-mail telling me my housing information was available. I excitedly clicked the link, ready to learn what bros I’d be chillin’ with pretty soon. Single occupancy? So I would be living by myself? They let freshmen do that? Though I tried to come up with all of the positives of living in a single, I couldn’t help but be disappointed at first. No roommates? How would I make friends? Who would I eat with for the first few days of school? These worries seem silly to me now, but at the time they were legitimate. When I first arrived at my room, and after I got over how small it was (I’ve dubbed it “the cupboard under the stairs”), I knew I needed to figure out a way to socialize with people from inside my solitary confinement. I eventually decided that the best call was to violate the university’s absurdly and unnecessarily strict fire code and prop my door open with a piece of cardboard. This was one of the best ideas I’ve ever had. As people passed through the hall they saw my open door and would stop and talk to me. In that manner, I managed to become acquainted with most of the people in my hall. This obviously would have been difficult to do if the door to my room had stayed closed. but enough for one person. Having overcome the first obstacle of living in a single, from there on out I learned to appreciate my living situation. There are a great number of positives. Privacy and quiet is easy to come by if I want, and I can study in my room if I want to (though I usually find myself distracted enough that I go to the library). And “needing the room to myself” is never an issue, though unfortunately I haven’t taken advantage of that as much as I’d have liked. Most importantly, there are no possible awkward moments when your roommate walks in and you’re participating in a potentially embarrassing activity (I’ll leave you to decide what that might be). What I’ve appreciated about living in a single is having the opportunity to observe the dynamics of different living situations and having the chance to choose my own next year. 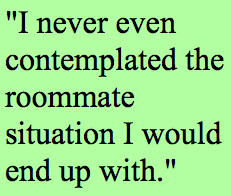 I’ve seen friends get along extremely well with their roommates and others that haven’t been as lucky. Next year I’m living in a quad with roommates of my choosing, and living in a single gave me the chance to scope out those very people without having to deal with roommates I may not have liked. All in all, I’m happy to have had the chance to do my own thing and live singly, and I can look back on my original worries and chuckle. I like the single life, and if I could do it all over again I wouldn’t change anything (though I wouldn’t mind a bigger room).